Browsing through Instagram has always been more like checking out a museum rather than shopping at a mall: you can look, but you can’t touch. 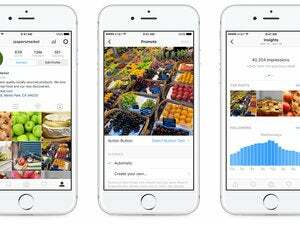 Well, soon Instagram users will be able to do a lot more than just gawk at pretty photos. On Tuesday, Instagram announced that the photo-sharing service will incorporate a button below certain sponsored photos to let users “Shop Now” for products, “Install Now” for apps or “Sign Up” for websites and newsletters. This is part of Instagram’s plan to become a more desirable platform for advertisers who are looking to engage directly with users using these call-to-action buttons. Instagram’s transition from photo-driven social network to full-blown e-commerce platform has been slow coming. Inserting a URL on the Facebook-owned app doesn’t even automatically hyperlink unless it’s part of the profile bio, so savvy retailers savvy have had to figured out ways to allow Instagram users to find and shop for products they’ve stumbled upon on their photo feeds. Startups like Like2Buy, Soldsie and Like to Know It give potential shoppers the ability to get more info and buy stuff featured on Instagram by simply posting a comment or liking the photo of the product. Why this matters: Instagram’s newest ad features is a move to try to get retailers like Target and Nordstrom (which partnered with Like2Buy) to choose the new built-in ad option to get Instagram followers buying their products. Previously, Instagram introduced a Carousel ad feature for brands wanting to show of a slideshow of images. All Carousels included a “Learn More” button that lead to a specific website. It was the first time that users could click on an Instagram image.